Battlefront is featuring their Local Force Company for Tour of Duty over on their website. 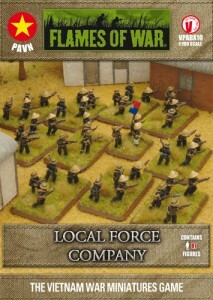 Local Force Company (VPABX10) includes one HQ Section with optional Type 58 LMG team & Type 31 60mm mortar, three Infantry Platoons each containing five Rifle teams, six Local Resistance teams, one Small three-hole base & twenty three Medium four-holes bases. Known as the Vi?t c?ng (a contraction of Vi?t nam C?ng s?n, Nationalist Communist, or alternatively Vi?t gian C?ng s?n Communist Traitor to Vietnam) in the south, the ? ?a Ph? ?ng Quân (local forces) are a mix of southerners returned from the north since the partition, and local recruits disaffected by the Saigon regime.